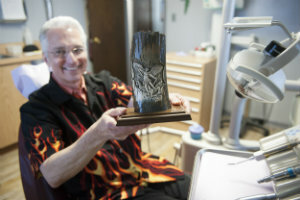 Paul Grussenmeyer Custom Creations' gallery is a major extension of Paul Grussenmeyer, DMD's personality as a artist, dentist, scientist, author, and speaker. His public artwork career began in 1990. In the interim, he has created numerous custom carved handles for many edged projects with world renouned bladesmiths and knifemakers as an associate member of the Knifemakers' Guild, carved ivory bow parts for Henryk Kaston's Renaissance violin bow series, and produced wearable and useable art pieces presently in collections around the world. This gallery contains luxury gifts for men and women: one-of-a-kind jewelry, belt buckles, knives, fine art, useable and free-standing art, plus other ideas which intrigue the artist. Paul seeks to to evoke inspiration, pride, confidence, individuality, and uniqueness in the proud owners of his artwork. He creates the fine detail in the raw materials by using dental handpieces, plus carbide and diamond burs in his studio, like he uses in his dental office. 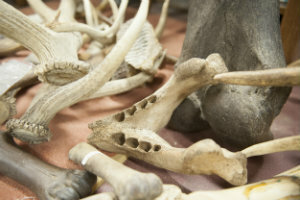 Some of the raw materials: fossil bones and antlers. 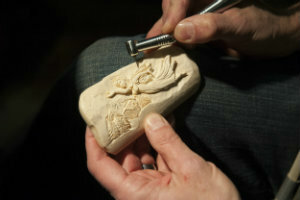 Carving a piece of fossil with a dental handpiece. Doc G showing off "St. Michael and the Devil" carved on a nice piece of blue mineralized 10,000+ year old woolly mammoth fossil.